Toshiba has announced the first HD-DVD writer designed to fit into a laptop, and said it expects sample shipments to begin by the end of 2006. The drive will allow mobile staff to create disks holding up to 30GB of data, compared with 4.7GB for a writable DVD. The Toshiba SD-L902A, demonstrated at the Ceatec IT show in Japan, can read and write dual-layer HD-DVD-R media, and read HD-DVD movie disks. The drive is also backwards compatible with all formats of DVD and CD media, including recordable versions. At 12.7mm high, the SD-L902A meets the specifications to slot into a laptop drive bay, enabling it to be used for backup and archiving, or carrying presentations on HD-DVD disks. The drive will no doubt feature in future Toshiba laptops. Earlier this year, Toshiba launched the first laptop with a built in HD-DVD reader, the Qosmio G30, designed to play high-definition digital video from HD-DVD media. HD-DVD is one of two standards designed to supersede DVD as both a data storage medium and a format for carrying next-generation high-definition video. Toshiba said that more and more people are using digital video, and want a platform to edit and work on material – a demand that it can meet with the SD-L902A. 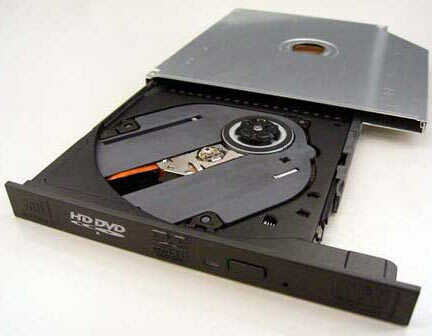 HD-DVD’s rival is Blu-ray, which has a higher capacity of 50GB on a dual-layer disk. Sony earlier this year introduced Vaio laptops with Blu-ray writers, and several vendors already offer Blu-ray writers to fit in desktop PC drive bays.